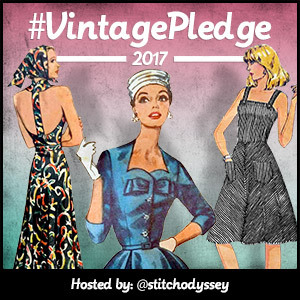 A couple of months back now, the lovely Marie from A Stitching Odyssey wrote a blog post about the #vintagepledge 2017 challenge which she organises every year. She has also talked about it in one of her youTube videos. The idea is to encourage sewists to use their vintage patterns more regularly, and post pics showing their makes. 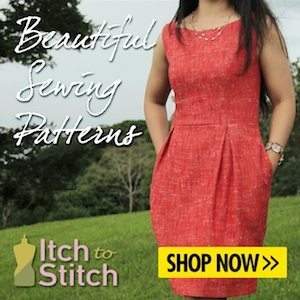 It’s a fun join-along and another great way to gain inspiration from so many talented and creative sewists. I don’t have many vintage patterns in my pattern stash. Probably about half a dozen. However this month I am taking part in the #sewtogetherforsummer shirtdress challenge (I love me a good hashtag challenge)! and whilst rummaging through my pattern stash to see if I had a shirtdress pattern I could use, came across this vintage pattern that I thought would be perfect. I have to say that making this dress was a joy. Although it was one of my most challenging makes in terms of SO many alterations and adjustments to my toile, the satisfaction of the end result was really rewarding. I will be writing a blog post on this particular vintage dress in the next few days, so look out for that if you are interested in seeing how it turned out. I have been wanting to join in with the vintage pledge challenge this year, but up until now simply hadn’t taken the plunge. Now that I have made this dress, I’m hooked, and don’t know why it has taken me so long. Other patterns in my stash include some from the ’90’s which I believe are technically ‘vintage’ with them being over 20 years old. My favourites though, are the dresses. I believe these are from the 60’s and 70’s, and I adore them. I may or may not have also just bought another 60’s dress pattern from eBay which I am waiting to be delivered. So my #vintagepledge 2017 is to make at least 3 items from vintage patterns this year. I will, of course, share all my makes with you here. Thank you Marie for bringing all this together, I would strongly recommend that you hop over to her blog and video linked above and check it out, and I hope this may give you the nudge to have a go yourselves!